PINNACLE CLAY LUBRICANT is specially designed to work with all detailing clay bars, natural or synthetic). A Lubricant and cleaner designed to remove dust and residue from paint finishes! Clay bars quickly remove overspray and paint contamination leaving the cleaned surface "smooth as glass". 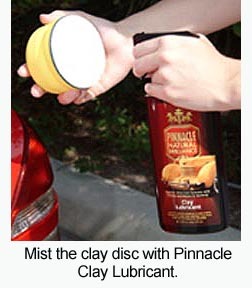 To work properly, all clays require a lubricant. Soapy water will work in a pinch but it provides only minimal paint protection and the detergents in some soaps can break down the clay causing it to disintegrate. Pinnacle Clay Lubricant is specially designed to work with all clay bars, natural or synthetic (new Poly-clays). Clay Lubricant creates a microscopic barrier between the paint and the clay cleaning material. The VOC compliant, high lubricity formula prevents loosened contamination from scratching delicate clear coat finishes yet it will not break down or degrade the integrity of the clay. The high lubricity formula is a blend of oils and wetting agents that are literally wetter than water. 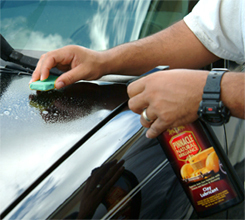 Pinnacle Clay Lubricant will not alter the paint surface in any way. Once you’ve clayed, wipe away the lubricant. The paint surface will be impeccably clean and silky smooth, the perfect foundation for a coat of Souverän™ Wax. contaminants out of the paint. 7. Once you’ve clayed your entire vehicle, apply a coat of Souverän™ or Signature Series II to protect the freshly cleaned paint. 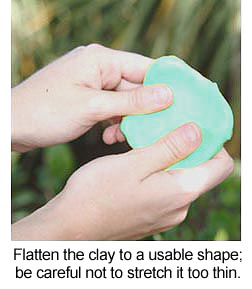 Clay will remove all existing wax. 8. 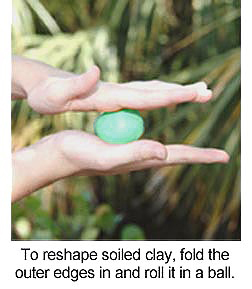 To store your clay, mist it with lubricant and seal it in an airtight plastic bag or container. 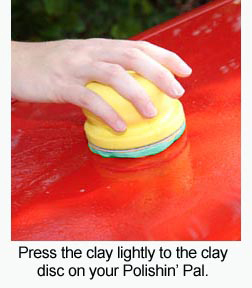 When using the Pinnacle Polishin' Pal with or Ultra Poly Clay, mist the Clay Disc with Pinnacle Clay Lubricant. Flatten the clay onto the disc. Mist the surface to be clayed with lubricant and continue as directed. Used this lubricant and clay on my '02 T-Bird and my '15 Bentley Flying Spur. First time laying and was amazed how easy it was. Followed up with sealant and carnival and the cars wish with no effort and water rolls right off, almost dry themselves. Makes Clay Barring much simpler. However there has got to be a way to make it more affordable. This bottle only goes so far. Next time I may by in Bulk that usually helps with cost. ConsCost of product in smaller quantities. Everything I expected. Ease of use, not one problem. Did what it's supposed to do. My first time claying, and this product along with the clay worked very nicely for me. Used it for the first time today and had no issues, it simply works.